Each year, hundreds of alumni and friends make a gift to Vanderbilt University School of Medicine. Please read below and visit the following links to learn about the many ways you can show your support and make a difference at one of the nation’s finest medical schools. Scholarships are one of the most effective ways to attract outstanding students. At VUSM, we are growing our endowed funds available for scholarships, thereby creating opportunities for both current and future generations of students. 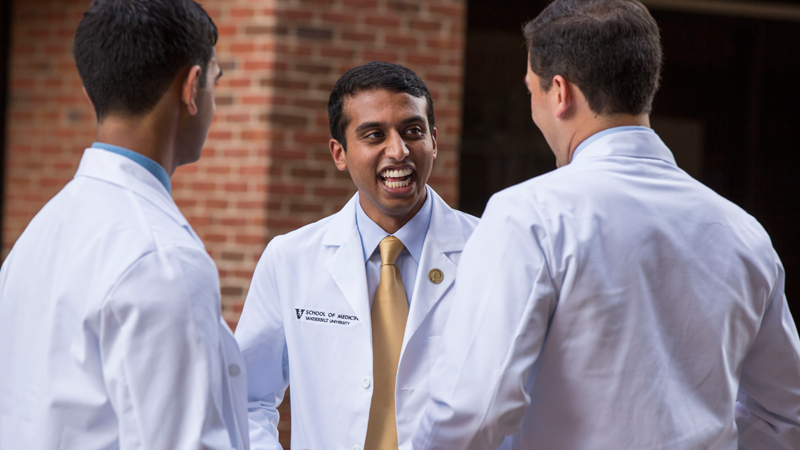 Almost 85 percent of VUSM students receive some form of financial assistance and the school is dedicated to providing opportunity to future medical leaders. The recognition and honor an endowed chair confers upon the faculty member holding it are vital incentives in a dynamic market where the best faculty are in great demand. On any given day, the vast majority of the school’s faculty can be found in their offices and classrooms, available to students and energetically involved in the life of the school. Endowed chairs enable us to retain such exceptional professors and to attract talented new faculty which places the School of Medicine at a decided advantage. The Chapman Society recognizes financial support of VUSM by those who make annual gifts of $2,500 and up. Alumni who received their degrees within the last 10 years are also eligible for membership with a commitment of $1,000 annually. Learn more about the John E. Chapman, M.D. Society. For more information on making a gift to Vanderbilt University School of Medicine, please contact VUSMGiving@vanderbilt.edu or a member of the Development and Alumni Relations staff.